May 13, 2016 Update - it took 185 days, but I finally received a reply to my letter, very disappointing, essentially a blow-off letter, written by the "old" Parks Canada on behalf of the Minister - it doesn't reflect the stated goals of the new government. Either the Minister didn't actually read the reply Parks Canada prepared or she doesn't understand the issues <sigh>. Whether your concern is about crumbling infrastructure on the Rideau Canal, lack of heritage support for the Rideau Canal, or loss of wildlife habitat due to improper development, you should make your voice known to those in charge. You find a list of email contacts on this page. If you've read through this website, you'll see that it's not a new problem, the recent cuts have only exacerbated an existing problem of lack of support for the heritage of the Rideau Canal. As noted on this website, there are lots of issues, not simply the recent cuts, to chose from. It was the Government of Canada and former Prime Minister Stephen Harper who were responsible for the cuts to the Rideau Canal. They made a decision to cut support for Canadian heritage while at the same time increasing spending in other areas. It's not a question of money, it's a question of priorities. I'm sure you can come up with dozens of ways that the government is inappropriately spending money other than the modest amount required for the Rideau Canal. Parks Canada is an agency under Environment Canada. The minister for that department, Catherine McKenna, can mandate that Parks Canada better support the Rideau Canal. I've written her a letter (see Correspondence below) and will post the reply when I receive it. With the previous government, I wrote a letter in 2012 to the Minister of the Environment at that time, Peter Kent (who got turfed from that position in July, 2013) and waited 207 days and got a form letter reply that didn't answer a single question I asked. Kent's replacement, Leona Aglukkaq, was no better. Hopefully now that we have a new government, the new minister, Catherine McKenna (who happens to have part of the Rideau Canal running through her riding), will be more responsive. Directly it is Parks Canada who have over the last decade, cut heritage support for the Rideau Canal and now, with a government mandated blanket cut to their budget, decided to make that cut deeper on the Rideau Canal (and other National Historic Sites) than other areas of their jurisdiction. It is also local politicians (federal, provincial, and municipal) who should be fighting to maintain the heritage values of the Rideau Canal - both for cultural reasons (the direct heritage of many of their constituents) and for economic reasons. They should be championing the Rideau Canal. Municipal representatives are on the public record with concerns about the season and the proposed fee structure. Rideau MPs have been generally quiet on the issue. If you would like to write a real letter and mail it, the following addresses can be used. Letters to Alan Latourelle, Carol Sheedy and Larry Ostola can be sent to the Parks Canada Agency address, letters to Darlene Upton and Jewel Cunningham can be sent to the Rideau Canal Office address and letters to the PM and MPs can be sent (no stamp required) to the House of Commons address. January 29, 2013, 1:24 pm - I waited 207 days, 3 hours and 35 minutes to receive a form letter reply (via PDF attachment in a blank email) from Minister Kent that didn't address any of the issues raised in my letter (which, given their reply, they clearly never read). See the Word Cloud analysis below. 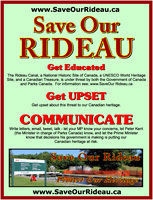 Given the PMO's comment that my letter "will receive due consideration from the Minister" and the resulting form letter that didn't address any of the heritage issues clearly means that the Government of Canada, and certainly Minister Kent, do not care about the Rideau Canal. It's a shame. Read the reply and judge for yourself.